You may not know it, but you are very likely to be using a high dots-per-inch (DPI) display today, especially if you use a laptop smaller than 15-inches. The fact is, if you use Windows XP, or even Windows Vista, you are actually not getting the most out of your monitor. If you have to squint or lower the resolution then you know what I’m talking about. Starting with Windows 7, you will not have to worry about this issue. Building on top of the improvements already made to support high DPIs in Windows Vista, Windows 7 is set to make changing DPIs as intuitive and as “safe” as changing resolutions. Just to take it one step further, Windows 7 will even choose the most appropriate DPI for you when you install. 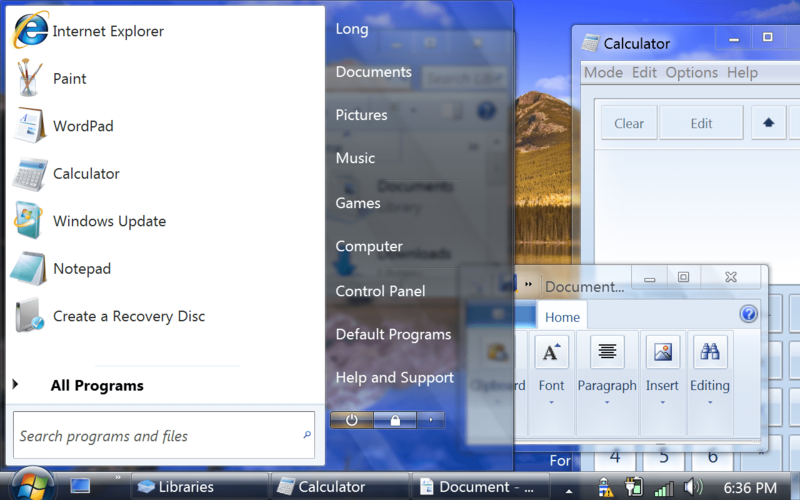 You know how high DPIs look in Windows Vista, so how does it look in Windows 7? Well I’ve compiled this set of screenshots again to show you exactly that. As you can see, the support for high DPIs in Windows 7 is pretty remarkable. Common issues with high DPI – clipped text, layout issues, pixelated bitmaps and incorrect font sizes have been addressed very well. In fact, the system is so advanced now you can even change DPIs just by logging out and back in, whereas you had to restart before. Personally, I’m convinced I will be using the non-default DPI of 120dpi (125%) when 7 ships. I’ll let you judge for yourself. Can you do some sort of comparison? I can’t see much of a difference. Having different screen resolutions and apps open make it harder too. What’s the lighthouse in the system tray? Changing DPI settings on Windows Vista today only requires logging out and back in again – a reboot is not required. Always tells me to restart still. Well they still need to get higher resolution icons for all stuff so they don’t look that blurry like in your screenshots now! Now the more intersting part is. What happens to legacy applications or 3rd party applications when you move away from 96 DPI? I Vista they behaved awfully and I doubt this will change in Windows 7. You had to make your applications explicitly DPI aware for Windows Vista and I doubt that will change for Windows 7. There a re still a remarkable large amount applications that break UI-wise with modified DPI settings. IE7 is one of them btw. Was there anything mention in this regard? i love how you modified the vista title to fit the 7 OS! not me, i bought 2 24″ monitors and 1 28″ monitor to maximixe my screen real estate. try opening up excel and see the number of visible rows and columns change as you increase dpi. why would i want to buy a monitor that has a resolution of 1920×1200 and then shrink it? i’ll stick with 96. Actually I need the damm scaling lowered and there is nothing below 100…. grrrr everything is just too big even on 100%! Long, I’ve been using High DPI since XP. 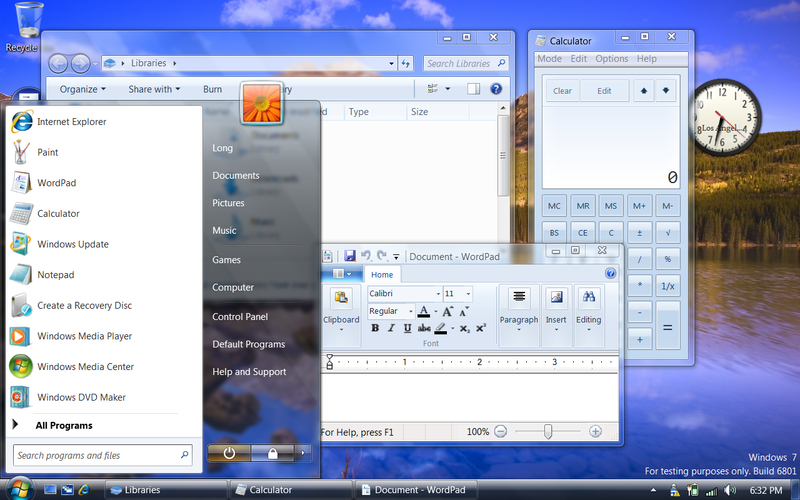 It’s actually not bad on XP, and definitely better on Vista. There are definitely a bunch of improvements to make the overall experience better in Win7 (per-user DPI, better support in the shell). Try it out on Vista, you won’t be disappointed. A 24 inch monitor at 1920×1200 is a 96 DPI screen. What happens when you have a 24 inch monitor that is 3840×2400 pixels? It would be unusable with the system set to 96 DPI. Windows Vista already works great with high DPI screens, like for example my 12 inch 1440×1050 (around 144 DPI) screen on my Tablet PC, which I run the system at 120 DPI. You can also tell it to scale legacy applications which use fixed pixel sizes, but that does make them somewhat blurry obviously. And contrary to what was said IE7 works great at higher DPIs, its just websites that use fixed pixel sizes that don’t! Honestly guys, when you see a high DPI monitor and a system set to higher DPI your jaw will hit the floor at how beautiful the text and UI is on it. It’s incredible. Nice to see Microsoft continuing to make improvements in this area, now if only every one else would start catching up. I don’t want to be stuck at 96 DPI forever. Ahh after looking closely they are not infact scaling! If you get a chance could you please ask someone about this and if they will change this? This is a pretty major problem with high DPI..
@Daniel: Gadgets do not scale, no. Another thing that makes dpi settings useless in Windows is when you have multiple monitors with differnt ppi. This is a common scenario wih notebooks and home PCs. Does Windows 7 adress this? I like how they’ve made larger system tray icons to complement the higher DPI settings. They stay sharp even at 200%. Now if they could do the same for Wordpad’s Ribbon controls. Where is the fancy new taskbar? Do we have to choose between fancy taskbar and whacky DPi? Can you show me the System properties, Advanced Settings, Power Plans, Mouse properties, etc? Actually, what has changed in Windows 7 except the log on/log off instead of restart? Is is different support for legacy apps? That is pretty good. Linux does it in real time, no need to log off and back on. It’s nice to see win catching up, albeit slowly. The screenshots you posted are from Windows Vista, not Windows 7. 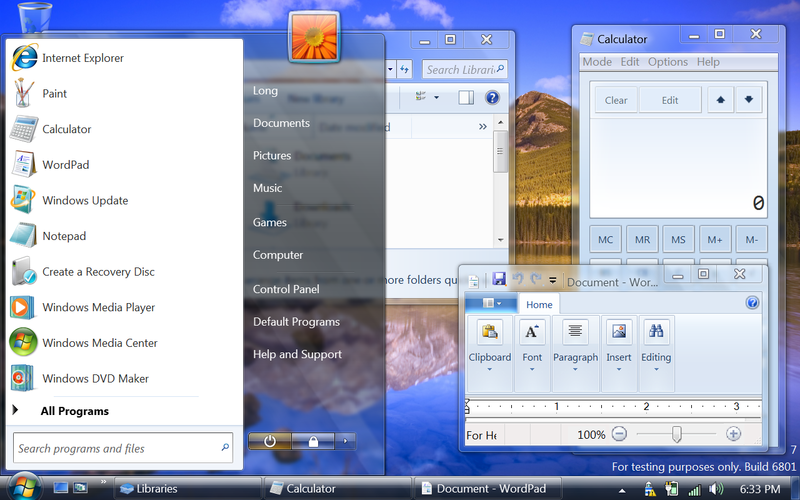 In Windows 7 the taskbar is not scaled and therefore the text gets clipped, while in Vista the taskbar buttons and icons get scaled to accommodate for larger text. ynkot, that is Windows 7. 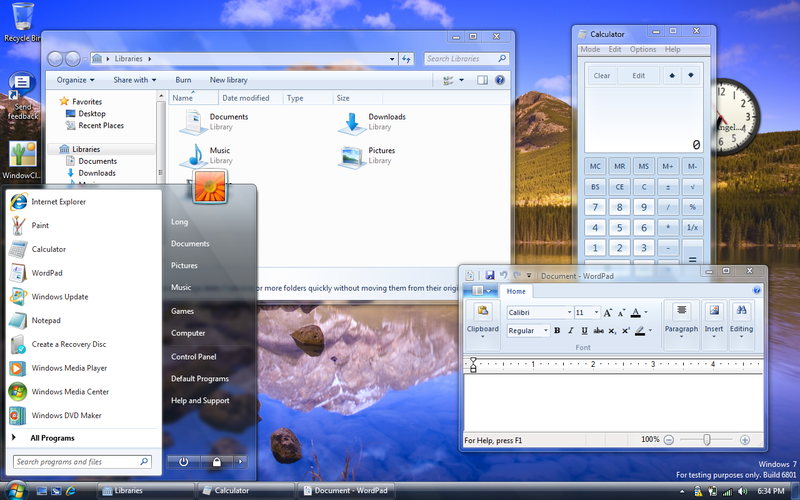 If it were Vista as you say, you’d have a hard time explaining the navigation pane in Explorer; the Show Desktop to the right of the taskbar; and the Ribbonized WordPad.